Consider All Options Before You Sell Gold In New York. Market Prices. The ability to sell gold in New York can open doors to acquire quick cash when you need it. Then again, you might have stockpiled quite a bit of gold to cash in as a solid investment vehicle. To sell your gold, you will need to visit a good dealer. The dealer you select must be a reputable one. Consider this the most basic of requirements when you wish to sell good in New York. There will be various other steps you will have to take in order to be sure you are going to get the best price on the sale. The steps you must take will be based on the type of gold you wish to sell. If you have been buying gold bars from a gold seller for investment purposes, then you will know the karats and purity of the gold. Things will be a little different when you wish to sell jewelry. 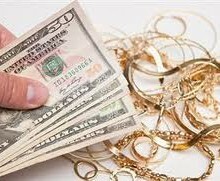 The value of the jewelry you want to sell will vary based on a host of factors. If the jewelry is a name brand designer item, it might end up being worth far more than would be the case if the gold in the jewelry is melted down. When your jewelry is so exquisite, it might be best to have it appraised prior to seeking any sales offers. Similarly, if you have what might be cosmetic jewelry, you want to take the steps to learn if the gold is real or not. Such information can make the ability to sell gold in New York a lot easier.